Albany, Ga. – Phoebe recognized area physicians Thursday with a special ceremony and a donation to a health-related charity in their honor. March 30 is National Doctors’ Day. Phoebe celebrated early by hosting a brief ceremony in the lobby of the main hospital to thank all physicians on Phoebe’s medical staff. The medical staff of Phoebe Putney Memorial Hospital is made up of 360 physicians representing 41 specialties. Around 175 of those physicians are employed by Phoebe. Phoebe used to commemorate Doctors’ Day by giving each physician on the medical staff a small gift. About 10 years ago, Phoebe decided that money would be better spent on a charitable donation in honor of physicians. Each year, the medical staff chooses a charity to receive the donation. This year, they chose Horizons Community Solutions. That organization began in 2002 as the Cancer Coalition of South Georgia. It expanded in 2016 with a broad new mission to improve wellness and economic vitality in southwest Georgia. 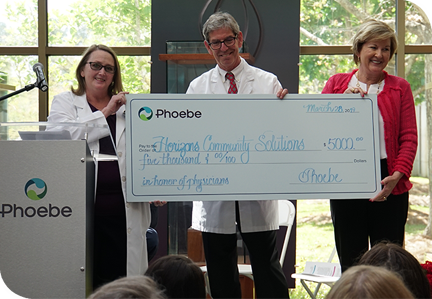 Horizons CEO Cynthia George accepted a $5,000 check from Phoebe. “We wouldn’t be able to do anything without our physicians and our hospitals. They are our partners,” George said. “Physicians make the health of our community. They take care of patients, and we work in concert with them. We will use this $5,000 for cancer screenings and to improve community health in this region,” she added. Doctors’ Day was first observed in Winder, GA on March 30, 1933. Eudora Brown Almond, the wife of a prominent physician, honored physicians by sending them greeting cards and placing red carnations on the graves of deceased physicians. Red carnations remain a symbol of Doctors’ Day. Phoebe provided red carnations at the ceremony and encouraged each physician to take one and pass it along to a patient or co-worker in recognition of the service physicians provide to our community. Phoebe also hosted special lunches in honor of physicians at its main hospital campus as well as at Phoebe Sumter and Phoebe Worth.